Samford Theatre for Youth students will perform at the Southeastern Theatre Conference’s Theatre for Youth Invitational Festival March 8 in Mobile, Alabama. According to Laura Byland, “The invitation to present at this festival is a great honor and will be Samford’s first appearance. Only three companies are selected to perform.” Byland is associate professor of theatre and dance. Byland will accompany 13 performers and 5 design/management students. They will present The Jungle Book, an adaptation by recent Samford graduate Kendra Ball of Rudyard Kipling’s book. 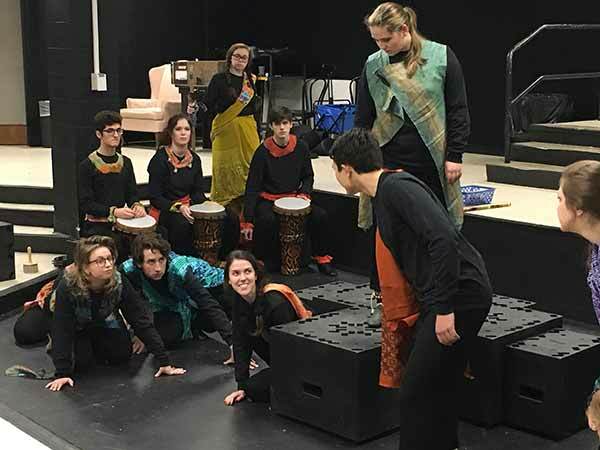 The theatre students toured this program last spring in local schools and will be presenting the program at Virginia Samford Theatre for area school children this week and then at Samford on March 28 at 4 p.m. in Bolding Studio. The festival provides valuable exposure to professionals, new audiences and peer students. Over the last quarter century, the Theatre for Youth Invitational Festival has showcased more than one hundred works to more than 25,000 young people. As part of the Annual Convention, the festival brings together artist and audience, playwright and publisher, performer and producer to explore the infinite world of Theatre for Youth and to work with and get feedback from some of this country’s pre-eminent figures in the field, Byland added. This year, the respondents include Suzan Zeder and Ernie Nolan, both highly respected professionals in theatre for young audiences. Byland highlights the value of this learning experience for her students and looks forward to taking part in the theatre for youth forum. To learn more about Samford’s theatre for youth program, visit samford.edu/arts/theatre-and-dance/theatre-for-youth-major.